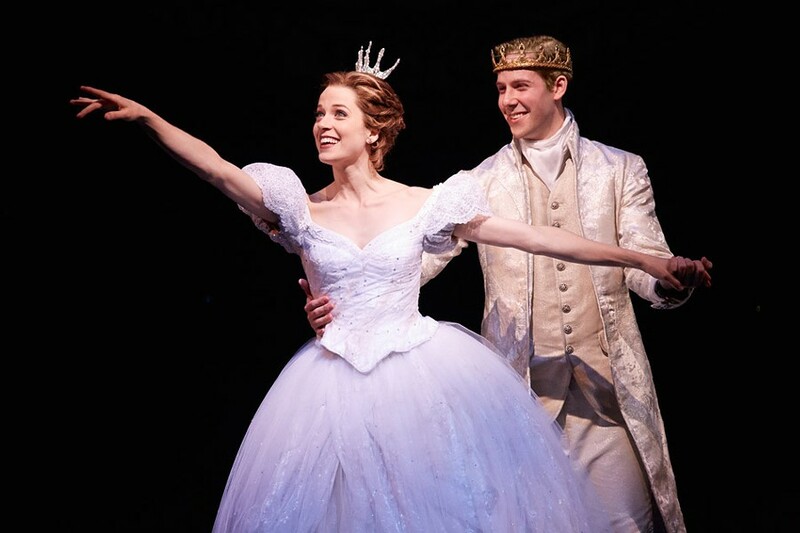 Theater Review: RBTL presents Rodgers & Hammerstein's "Cinderella"
PHOTO PROVIDED Paige Faure and Andy Jones appear as Cinderella and Prince Topher in the touring production of Rodgers & Hammerstein's "Cinderella." A nearly sold-out audience filled the Auditorium Theatre, Tuesday, for the opening night of Rodgers & Hammerstein's "Cinderella," brought to town by the Rochester Broadway Theatre League. I was surprised at the full house (on a Tuesday) and the age-span of the viewers, from pre-school tots to grandparents pushing walkers and in wheelchairs. Little girls -- and some boys, too -- clad in dress-up clothes and wide-eyed with delight despite the hour, drove home the wonder that great theater can bestow. In Britain, pantomimes or "pantos" -- entertaining family theater with fantastical storylines and sometimes brash humor -- are a traditional part of the holiday season. It is pleasing that Rochester has the chance to escape into on-stage magic with "Cinderella" in the run-up to the Holidays. This "Cinderella," a 2013 Tony Award-winner, was full of spectacle, props, and costume changes, leaving you scratching your head in amazement. "How do they do that? The magic," my 6-year-old companion, Lily, whispered incredulously when Cinderella's pumpkin disappeared in a swirling fog of smoke which cleared seconds later to reveal a large, shiny gold carriage harnessed to incredibly real-looking horses. Gasps filled the old theater when Cinderella's drab brown and green everyday outfit materialized into a shimmery white ball gown after a few twirls. What sorcery is this? Kudos to Costume Designer William Ivey Long who won the 2013 Outer Critics Circle, Drama Desk, and Tony awards for his work on this show. The storyline differs considerably from the fairytale story, but, hey, artistic license and all that. And while some tots may have been disgruntled at the plot changes ("That's not how it goes!" Lily complained when Cinderella scurried back to fetch her dropped glass slipper after the ball), the spins on the story probably kept weary adults more alert and engrossed. The stand-outs in this production are Kecia Lewis as Marie, a "crazy" homeless woman (and fairy godmother); and the hysterical stepsisters, Aymee Garcia as Charlotte and Ashley Park as Gabrielle. Beth Glover delivers a darkly humorous stepmother and Paige Faure is charming as Cinderella, all goodness and light. Blake Hammond was excellent as Glover's foil, Sebastian, adviser to, and manipulator of, the sheltered Prince Topher, played by Andy Jones, who exemplifies boyish ideals and princely good looks. The show's straight-forward humor keeps coming at you, peaking whenever the stepsisters and mother are on-stage. "Seriously?!" Charlotte quips when the prince runs after Cinderella. "Seriously?" This "Cinderella" features a new character: Jean-Michel, a revolutionary who is wooing one of Cinderella's stepsister Gabrielle. His determination to open the young prince's eyes to the vast injustices in his kingdom add a politically correct tact to this tale of domestic enslavement, but, in my opinion, wasn't really necessary. Or, maybe, I just don't like the storylines of my fairytales messed with. The music and choreography seemed close to perfection. No wrong notes, no un-pleasing voices, just professional deliveries of clever show tunes. On the other hand, none of the songs stayed in my head after the show ended. The choreography by Josh Rhodes, however, went beyond what I expected, incorporating romantic lifts during the ballroom and wedding scenes, and a humorous number featuring the unchosen women of the kingdom holding and clapping together their not-sought-after dance slippers. There was a brief blight in Tuesday's performance when technical difficulties stopped the production for a couple of minutes during the first act. However, Lewis was on-stage and adeptly turned the misfortune into almost a humorous episode. Surely, the technical issues will be righted by the next performance. All in all, "Cinderella," is rich fare for those seeking bedazzlement, romance and superb song and dance on-stage.